What are the requirements for using SLI? I've just got a second graphics-card and I wanted to try SLI. After I've installed the latest driver for my cards (bother are the exact same model and chip), I was able enable SLI in the Nvidia Control Panel. Somehow my system is not happy at all with those cards. I'm getting hard lags in normal operating mode. Windows lags hard, I cannot move or some windows, even the sound is laggy (when running music sometimes there is no sound for 1-2 sec). I've read, that RAM has to be SLI-Certified and that CPU might be the issue. How would I track down the source of the problem ? If any other detail is needed I will add them ! (just let me know in the comments). Although the bridge is not explicitly required to enable 2-way SLI with most GPUs, it provides a dedicated communication pathway for the GPUs to exchange data across. When this link is not present the PCIe bus will become the means of communication, which can degrade performance. If we take all these facts in consideration, the natural conclusion is that for some reason your SLI bridge is not functioning. The two video cards have probably established SLI across the PCIe bus, with resulting poor performance, as described in the documentation. It is impossible to analyze a physical problem causing the non-functioning of the SLI bridge without physical access to the computer. A software problem can only be in the driver. 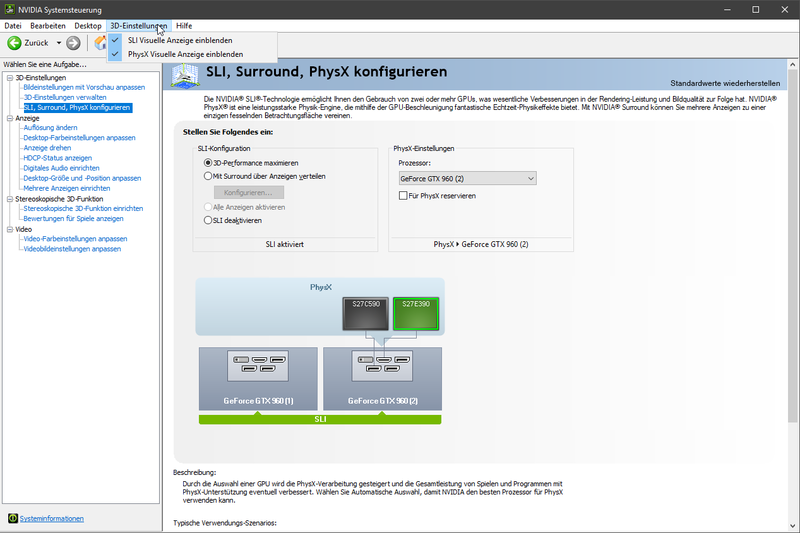 Try in the page of NVIDIA Driver Downloads to use the option of "Automatically find drivers for my NVIDIA products", so as to let NVIDIA analyze your hardware and suggest the right driver. Verify that it's exactly the one that you are already using. Not the answer you're looking for? Browse other questions tagged windows-10 nvidia-graphics-card lag sli or ask your own question. What does “SLI ready” really mean?